June 16 , by Mardi Robyn. I am fascinated with rocks. I love the different shapes, sizes, textures and colors. As a child I collected rocks. My collection consisted of several plastic gallon ice cream buckets full of rocks I picked up wherever one caught my eye. I would examine the beautiful rock and put my new-found treasure in my pocket to keep it safe until I put it in a container with my ever-growing collection. As a child I would pick out a pretty rock and give it to my Daddy to take with him on his business trips out-of-town. When he came home he would pull the rock out of his pocket and tell me he kept it with him everyday. Often times my Daddy would bring home a little rock he found that he thought I would like because it was perfectly flat and smooth, an odd shape or a pretty color. Today I am in my twenties and I still have a collection of rocks. Rocks from a creek that my oldest nephew brought back for me, odd shaped rocks found by my Daddy, or his friends that know I like rocks. Rocks my Mama finds on her way to the mailbox or walking out in the yard, and rocks I have spotted and had to pick up. I love rocks and this tutorial by Zina from Efzin-Creations is a perfect way to display a favorite rock. Zina shows how to take sea rocks and turn them into a trendy ring. If you do not have sea rocks you can use a rock you found out in your driveway. Zina uses paint to add color to her sea rocks, but you can also use fingernail polish. This tutorial inspires me to pick out a few rocks from my collection and turn them into rings! 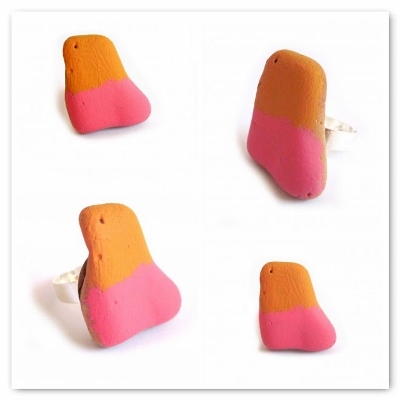 Check out Zina’s tutorial and learn how to make your own Sea Stone Rock Ring. I guarantee it will be an eye catcher and may even start a conversation! Thank you! this post and the introduction is simply adorable! You are welcome! Thank you, I enjoyed posting about the tutorial! Awesome tutorial, I too had a huge rock collection when I was a child. I love this idea to show them off! Thanks for sharing! I will definitely try this one! Lovely tutorial and easy to follow!